I totally get it: finding a way to keep muddling through in the midst of stress isn’t always the best answer. Sometimes it helps to find a way to actually remove a layer of stress. Can You Remove a Layer of Stress? There are, perhaps, two ways to approach this, on the timely-but-probably-horrible analogy of getting your car unstuck after a snow storm. You can stand on the roof of the car and start digging with your shovel. 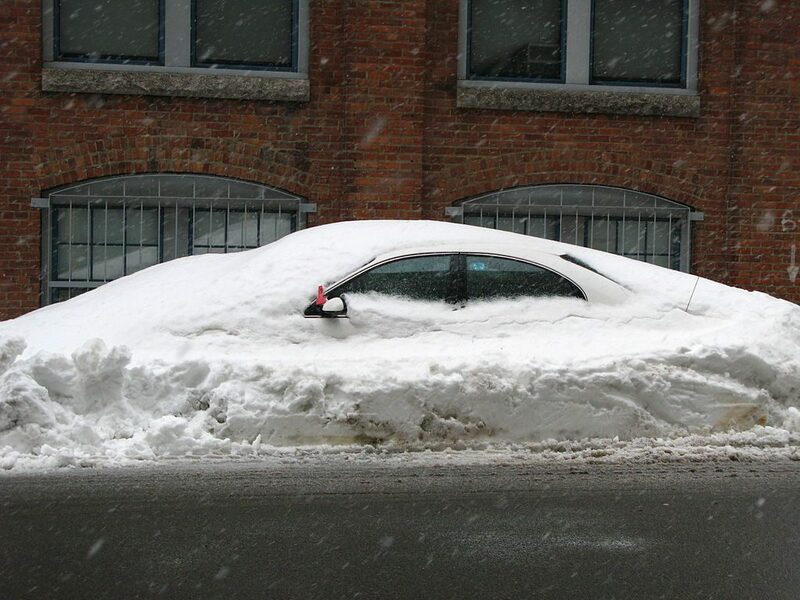 You risk scrapes and dents, and when you are done the car is still in deep snow and can’t drive. Or you can shovel around the car, scrape the windows, and drive off, letting the snow fall off the roof as you go. Like standing on the roof of the car to shovel, reducing stress by ripping a commitment out of your life can go very wrong very fast. Sometimes when people are really overburdened they do something rash — quit a decent job, break off a relationship that is actually working, or whatever. The real problem is still there inside, and it will bubble up in the next job or relationship. Growth is often a matter of staying where you are planted and solving the problems. People also try to dig out temporarily by self-medication: We drink too much, distract ourselves with our Facebook feeds, or buy some shiny object online. Afterward, there we are with our stress unchanged — but now we have a hangover, depression from the horrid stuff on social media, and a bigger credit card debt. In your situation I think the trouble is that there is so much stressful stuff pouring into your life that it is hard to even know what to think about — or to pray about. You need a way to get some clarity — shoveling around the car and scraping the windows so you can see where you are going. If you could take a couple days off I’d encourage you to find a monastery, convent, or other retreat center and head off to a time of deep rest and prayer. It has a wonderful way of sweeping away the piles and bringing some clarity. But that’s not possible for you at the moment. Someday maybe. I want you to think of Ignatius as someone with enormous skills at helping people hear God’s voice. He taught approaches to prayer that can bring focus in the midst of life’s chaos. Some parts of the process are not likely to suit you, but he developed one very useful practice of looking closely, daily, at your life and listening with care for what God is doing. He called the practice “discernment of spirits” and it works like this. At the end of each day, you open your journal and jot some notes about what happened that day. Then you ask yourself two questions. First, ask “What were the ‘consolations’”? By this Ignatius doesn’t mean “What was fun?” or “What made me happy?” Ignatius wants you to look much more closely than that. grow in hope in God’s good work in and around you. Things that build love, faith, and hope in God are not always happy. Sometimes they are the hard bits. But it can be anything. Write them down. reduced your sense of hope in God’s good work and direction for you and the world. Things that undercut faith, hope, and love for God are not always the unpleasant things. Many people find that very some of their most enjoyable sins end up destroying their relationship with God. So, what I’m recommending is that you add this little practice to your prayer life. Ideally at the end of the day, take a few minutes with a journal and pen, and look at your life. What things were building faith hope and love? What things were eroding faith hope and love? Don’t expect to have life changing insights the first day. The thing is to keep it up, day after day. Look back after a week at all the days. Then do it another week, and look back again. Eventually, in the patterns, you’ll get a sense of what is going on in your life — and what God is up to. You see the kinds of things that are building or eroding your relationship with the God who gives you new life. Finding the patterns helps you begin to organize your stressors. You may well figure out how to remove some particular stressor, or how to handle it differently. Think of it as a way to listen closely enough to your life that your life begins to make sense again. Then you’ll know what it is you need to bring to God in prayer. My annual lenten prayer class is coming soon! We’ll work on the Examen and other classic approaches to prayer that help re-ground us in Christ and bring focus to our prayer lives. Click the button and get on the waiting list if you want to be notified when it is open for registration. Thanks for the practical advice. “Sleeping With Bread” is a good book — I always have extra copies to give to people. Great stuff, Gary. Thank you.